Before there was Brooklyn Flea there was Green Flea at IS 44. Located on the Upper West Side of Manhattan (see map) this market started as a fund raiser for the PTA of the local middle school. Today it is an amazing collection vendors. Over the past 25+ years it has become a Sunday tradition. This is not a neighborhood "tag sale." These are serious vendors. The range of products go from inexpensive knick-knacks like hand and candy to vintage books and magazines, costume jewelry, and fantastic furniture. Some vendors sell the relics from our collective past - magazines, signs, kitchenware. She uses classic pictures of movie greats (Pam Grier, Eartha Kitt, Audrey Hepburn), African American culture (Josephine Baker, 1920's French advertisements) and other cultural references. 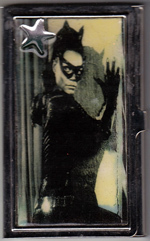 I loved the Eartha Kitt - Catwoman case, so I snapped that up. She also makes pendants, Hair bands and other wonderful things. Another vendor that we loved was Susan Bellinson who designs and sells her wares under the name of Sucaro. Sucaro produces a new must have for travelers - The Freedom Sling. This update to the fanny pack is both stylish and serviceable. The Freedom Sling has 3 front pockets with individual clasps and top and bottom zippered pockets. It can be worn cross shoulder or at your waist. We both bought one for our upcoming summer trips. Operating year round, with indoor and outdoor vendors, GreenFlea is a great place to spend a couple of hours on a Sunday.